Van Heusen The best selling business shirt brand in department stores in Australia. Van Heusen has been associated with stylish, affordable and high-quality shirts since introducing the patented soft-folding collar in 1921. Bracks First Created in 1956 the Bracks slack brand is without a doubt a true Australian fashion icon. Pierre Cardin Pierre Cardin remains one of the best known fashion brands in the world today, celebrating over 60 years. 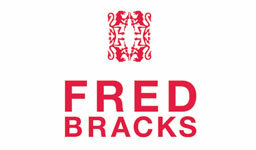 Australia’s Leading Trouser Brand, Bracks, brings you the relaxed, youthful Fred Bracks range. With a laid-back, urban aesthetic, the collection features classic, yet affordable, easy-to-wear modern wardrobe staples. Fred Bracks offers a wide range of products, from relaxed business wear to chinos for the weekend. Renowned for its classic detailing and quality design, the Fred Bracks brand is all about value for money prices without compromising on style. No Products were found for this brand. Find out more about becoming a reseller or just send us your email using the form below and we’ll be in touch.